Summary: Correspondence analysis of codon usage data is a widely used method in sequence analysis, but the variability in amino acid composition between proteins is a confounding factor when one wants to analyse synonymous codon usage variability. A simple and natural way to cope with this problem is to use within-group correspondence analysis. There is, however, no user-friendly implementation of this method available for genomic studies. 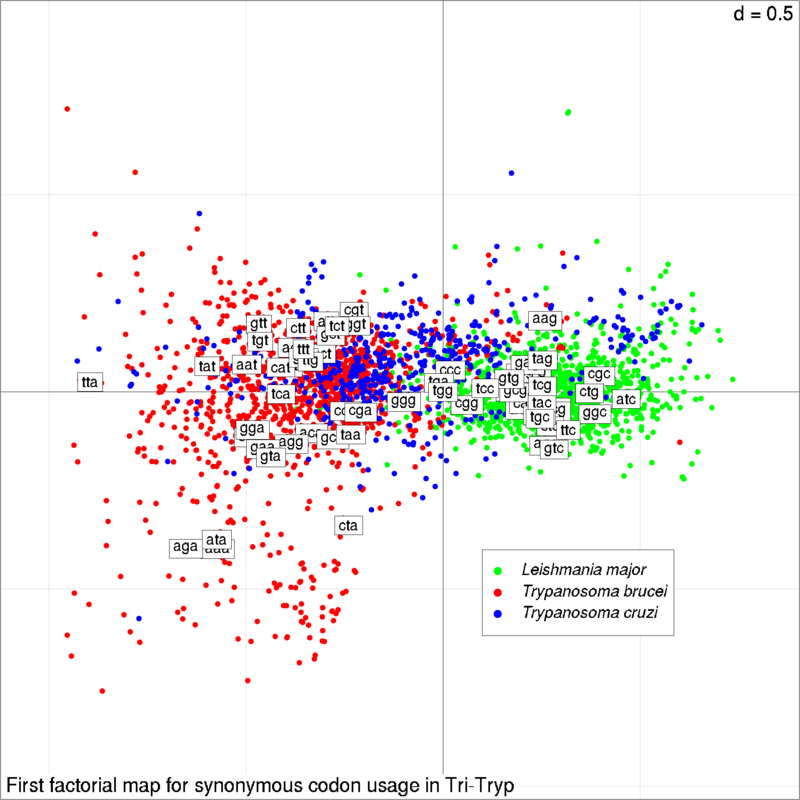 Our motivation was to provide to the community a Web facility to easily study synonymous codon usage on a subset of data available in public genomic databases. Availability: Availability through the Pôle Bioinformatique Lyonnais (PBIL) Web server at http://pbil.univ-lyon1.fr/datasets/charif04/ with a demo allowing to reproduce the figure in the present application note. All underlying software is distributed under a GPL licence. # for runing the script in a different context. # of R and the packages. # its content is stable to allow for the reproducibility of results. # data from Leishamnia major, Trypanosoma brucei and Trypanosoma cruzi. # From sequences, build dataframes with codon usage for each sequence. This line selects the data bank in which we want to retrieve the sequences to be analysed. The complete list of the different banks that are accessible is available here. 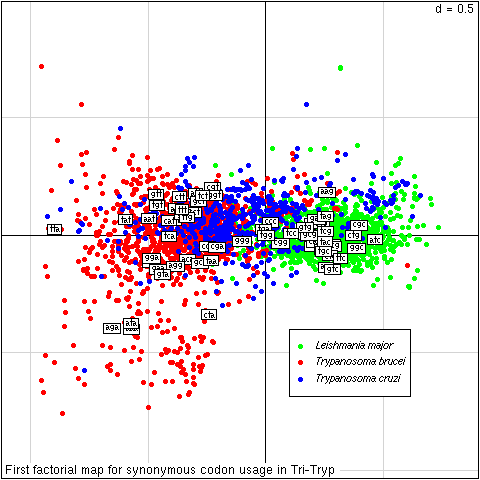 Here the bank trypano is a frozen subset of GenBank: its content is stable to allow for the reproducibility of results. It was build on 27-JAN-2004 from GenBank release 139 by selecting data from Leishamnia major, Trypanosoma brucei and Trypanosoma cruzi. It contains 117,177,046 bases 158,838 sequences 4,744 subsequences and 2,114 references. The second step is to get all the sequences mnemonics we are interested in. Because we are using the same query for three different species, we define a simple function to avoid code duplication. As input it has two arguments: listname to store the result of the query and species which contains the name of the species of interest. The mnemonics of corresponding sequences are stored in lm$req (1,467 sequence names) tb$req (1,772 sequence names) and tc$req (679 sequence names). From them, we can extract the sequences, this is the next step. For this, we just apply the function getseq to our list of sequences names (they are returned as a vector of chars). And then download the corresponding file from our ftp server there.